Himachal Pradesh dressed in exotic natural beauty is one of the most preferred hill stations for tourists from every nook and corner of the nation. Shimla, Kulla, Manali, Dharamshala, Dalhousie and many more visiting places in this hilly state nestled in the foothills of the snowcapped peaks attract thousands of tourists every year who are captivated by the magical scenic beauty of this hill station. Find more info on Himachal Pradesh visiting places. Himachal Pradesh rests serenely in the North West of India, with the Himalayan ranges rising majestically to the skies in the North, Tibet in the East and then the gently rolling lush green pastures of Punjab to the West and South. Himachal has rivers, plains, valleys, mountains, lakes and is blessed with an abundance of flowers, foliage and fruits, a land blessed by the God, the Land of Gods, an unforgettable experience for tourists from any part of the world. If the mountains do not stun you with their glorious majesty, the rolling and frolicking rivers will; if the forests do not entice you the lakes will beckon. A week or a month is just not enough for you to have your fill of this tapestry of natural beauty where snow and grasses mesh with rocks, flowers and woods. Himachal offers unmatched charms in its scenic destinations such as Shimla, Manali, Kufri, Chail, Dalhousie, Kullu, Dharamshala, Kasauli, Kinnaur and Palampur Tiger Reserve. These are by no means the only places. Rajgarh, the lush green valley is just as attractive a destination as Pragpur and the Maharaja Pratap Sagar lake sanctuary leading you on to Kangra Fort. Himachal offers something for every taste. If you wish to bask in the bucolic charms of rural environs, Himachal invites you to immerse yourself in local culture as yet untouched by modern influences. Visit Pragpur in Kangra, the first heritage village of India along with Rukhala and Naggar. It is a different world altogether. Himachal has a spiritual side you can explore to the fullest. Buddhists make a beeline for Dharamshala and McLeodganj where time stands still and you can see monks still practicing the same way they used to do since centuries. Hindus can have their fill of temples such as the Hatkoti Temple, the Bajreshwari temple in Kangra, Baijnath temple near Palampur, the Chamunda Devi temple near Dharamshala and Jwalamukhi temple close to Kangra. Then you have the Raghunathji temple in Kullu, the Bijli Mahadev temple in Kullu, Chhatri Temple and Lakshmi Narayan Temple in Chamba, the last being one of the oldest temples in the State dedicated to Vishnu and Shiva. Do not miss Raghunathji temple in Kullu. The Gurudwaras at Manikaran and Rewalsar attract Sikhs. For Buddhists, a visit to the Tabo and Kye monasteries along with Kungri Gompa, Shashur and Kardang monasteries is a must. Christians have a presence here and the Christ Church in Shimla is a landmark with its beautiful stained glass windows, just as beautiful as the St Michael’s Church with its marble altars and candles lighting up the place in a holy glow. Truly, Himachal is the Land of Gods. The adventurous can have their fill of action in Himachal. Tourism, especially adventure tourism is highly developed here and you can go skiing in Manali and Kufri. There are hundreds of steep mountain faces you can climb and if you are so inclined, indulge in hang gliding at Bir and Billing. Boating and rafting become perilous, breathtaking and thrilling if you care to dare the boiling waters of Himachal’s rivers. The rivers also offer an opportunity to go fishing. For those with a taste for wildlife, Himachal Pradesh offers ample opportunities to fulfill your desires. Just lose yourself in the grand vistas of the Great Himalayan National Park or move on to the Pin Valley National Park or to the Maharaja Pratap Sagar Lake. Go on a safari and meet animals and birds face to face, take photographs and come away with some remarkable memories of living life in the great outdoors. 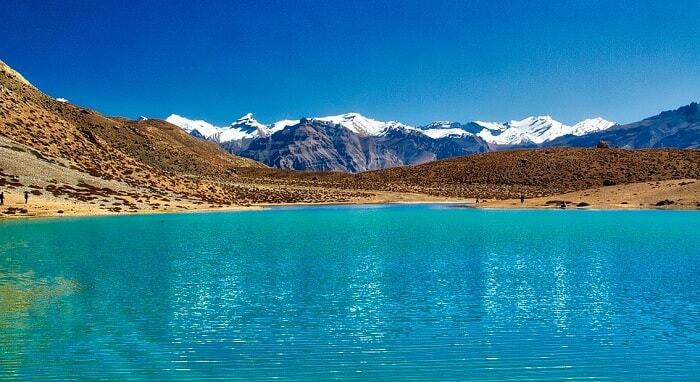 If you go to Himachal, you simply must visit Spiti, close to Ladakh and Tibet, ahead of Manali. This is a unique world, quite unlike anything you will come across anywhere in India. Then there are the passes. The two most visited and famous passes are the Rohtang and Baralacha with Pin Parvati and Kunzum the other two. Baralacha is on the Manali-Leh Road at a height of 4890 meters, leading you on to Suraj Tal Lake. Rohtang Pass is at height of 3978 meters along the Manali Keylong Road whereas Pin Parvati and Kunzum are in the Spiti district. These two passes lead you to the confluence of Sutlej and Spiti (Pin Parvati) and to the Bara Shigri Glacier, the second largest one in the world. These passes are open only for a few short months during summer so plan your tour accordingly. If it is scenic beauties of nature that appeal to you, then the first place you will visit is the Baspa Valley in Kinnaur, a veritable Shangri La with its mountains, valleys, forested slopes and rivers. While here take a trip to Sangla and Kalpa villages, quaint and frozen in time. Sangla has the Kamru Fort with a Kamakshi Temple, a much visited place. Kalpa is known for the Kinner Kailash Mountain that changes colors through the day. The dreamy Pin Valley is another place that will enthrall you with its symphony of mountains, Spiti River, quaint villages and the main attractions: snow leopards and Ibex. The Lingti valley is a repository of history where you will find fossils dating back 250 million years. Keylong, above Bhaga River is poetry of greenery and water bodies melding seamlessly with snowcapped mountains and water bodies, a place where you can enjoy nature in all its finery. There are places where you can find crowds and places where you can find peace and quiet. Some of the off-the-beaten-track places are Khoksar, the coldest place in Lahaul in winter. Rakcham has a charming beauty all its own as people who visit Kinnaur are now discovering. Nako is perched at a height of 3662 and getting there is a feat, quite rewarding, in itself. The breathtaking scenery spread below you is worth the effort. Kibber is another village, one of the highest in the world, an eagle’s eyrie at a height of 4205 meters and from here you can go to Gette, the highest village in the world. Pack your bags and go: Himachal beckons.